The buzz surrounding Kiev’s post-revolution cultural boom is dissipating—slowly, a fully-fledged, thriving fashion scene is forming in the wake of the ‘post-soviet’ hype. Few stoked the fire for this explosive fashion renaissance quite like Ukrainian designer and innovative force Anton Belinskiy. 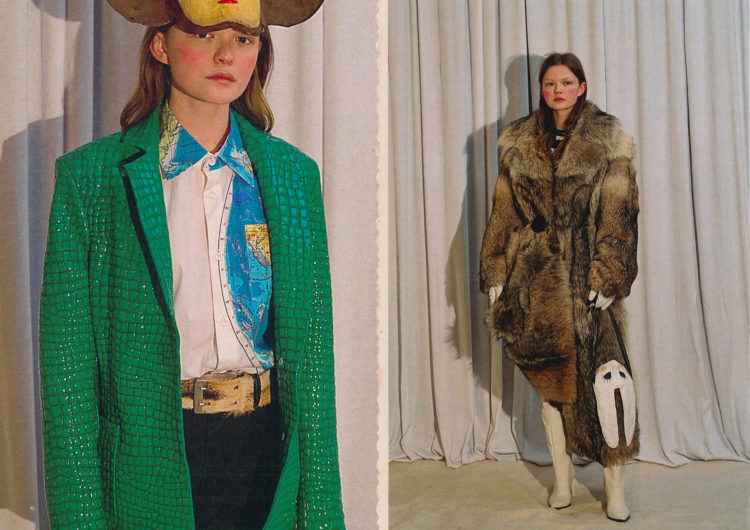 His playful, but conceptually fleshy, collections capture the spirit of Ukraninan youth, exuding effortless cool and the deeply subversive, radical attitude that endures in the city to this day. Such is an approach that has catapulted him into the elite fashion stratosphere. But even since garnering heavyweight international accolades—including a coveted LVMH award nomination in 2015—the heart of his work still harks to the chaotic, rebellious spirit thriving in his burgeoning home city. 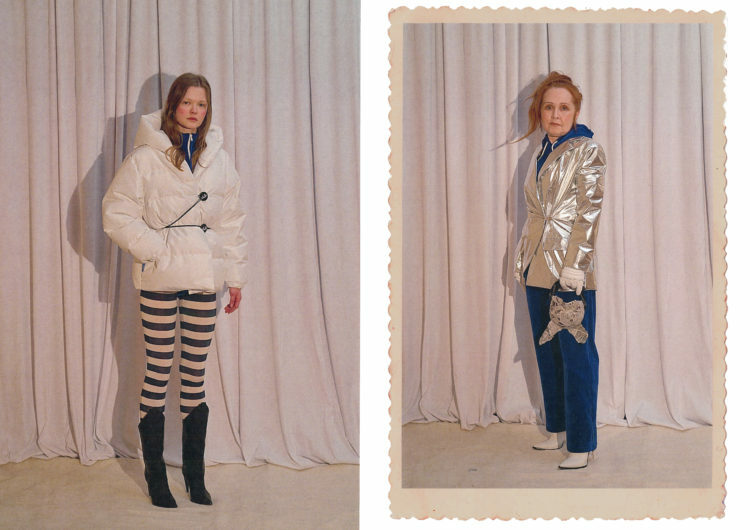 The signature aesthetic Belinskiy polished in Kiev—asymmetrical, distressed cuts, block colours and sportswear additions—have remained his trademark, but the designer’s conceptual narratives have evolved. While Belinskiy’s earlier collections were decked out in national symbols and politically dissenting statements, a new line for AW19 sees the designer preoccupied with quieter, but no less intriguing, inspirations, namely the overlooked traditions and cultural facets of his homeland. 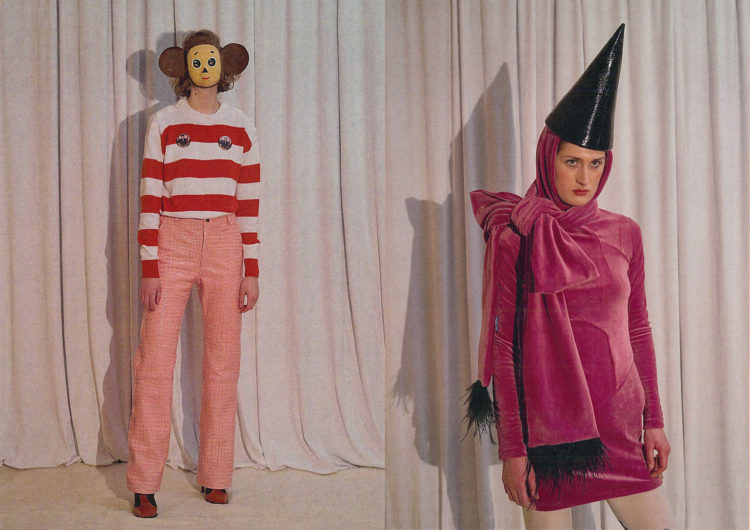 Inspired by utrennik celebrations held in kindergartens in Kiev, Belinskiy serves up childhood nostalgia through a haptic exploration of adolescence—think velour, baggy knitwear, and thick cottoned tights. 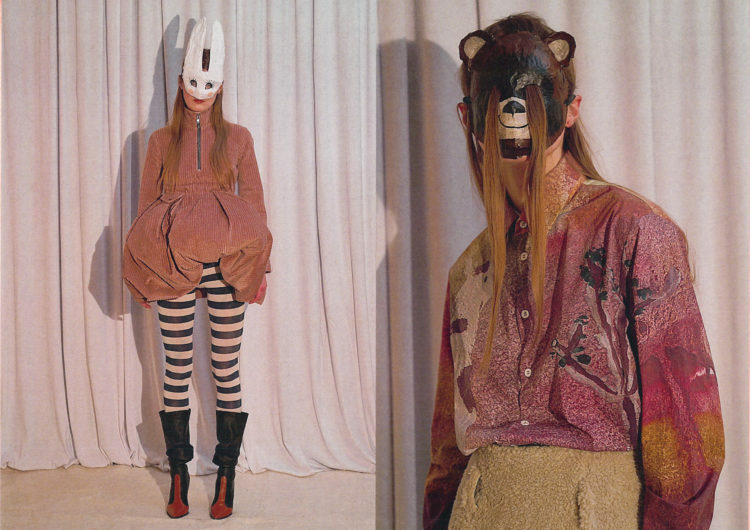 Amongst a fashion scene a little over-saturated with cold post-soviet aesthetics, Belinskiy puts on a puzzling kids party. 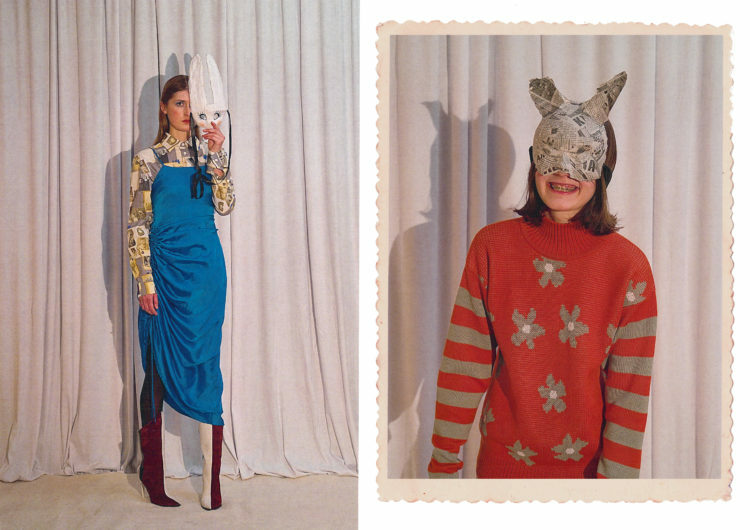 Awash with primary colours, playful prints and papier-mâché, the collection sits somewhere between a childlike wonderland and the uncanny valley. Following up on this strange, but enchanting fashion offering, we catch up with the designer and talk Ukrainian identity, collaboration, and how politics have left his heart. Your work evokes the daily life, rituals, and ceremonies of Ukraine, most notably the Orthodox churches and utrennik celebrations in Kiev. What drives you to tell stories about Ukrainian identity? Ukraine is where I grew up and where I lived for so many years—it is my homeland, it is in my blood, this life literally flows through my veins. So these are naturally the most meaningful stories I can tell. How do reactions to your work in Eastern Europe compare to elsewhere? I’d say that the younger generation gives great feedback, whereas from everyone else is mostly just a bland “meh”. It is so nice to receive messages from youngsters saying ‘hey, thanks for doing what you do, love it!” – they are interested, they say my work is, well, “lit” etc. UA locals who are a bit older–let’s just say they have a more Soviet-style closed-off mentality. Again, this depends—people who’ve been on the art circuit for years, successful and established creatives—they definitely do understand, they like it. Your work has featured consistently inventive political commentary, do you think its important for a designer to be political? It is not important. At all, really. Nothing should be forced. Back then, when politics were in “revolution” mode in Ukraine, my emotions were so strong and of course, this translated into my work. When someone feels strongly about something it naturally flows into their creative output. If I saw and felt anything meaningful in the politics that surrounds me right now—I would react, it would be in my current designs. But politics—this has not been the case recently. My brand is a literal reflection of my current feelings and emotions. The most honest thing you can do as a creator is to speak from what’s within, to speak from your heart. Politics are not in my heart right now. By founding DIY events such as One Day Project your commitment to working with local artists is clear—why is collaboration so essential for you? These are all my friends! We spend so much time together, so eventually, we started working together too. If I’m in Paris, I collaborate with my close friends here as well. I’m friends with people because we have mutual interests, because I like what they do. It’s natural for us to eventually start doing something together, to collaborate on creative projects. How would you say your design style and inspirations has evolved over the years? I can not give an answer, I really don’t know what to say. It is very hard to judge my own work. 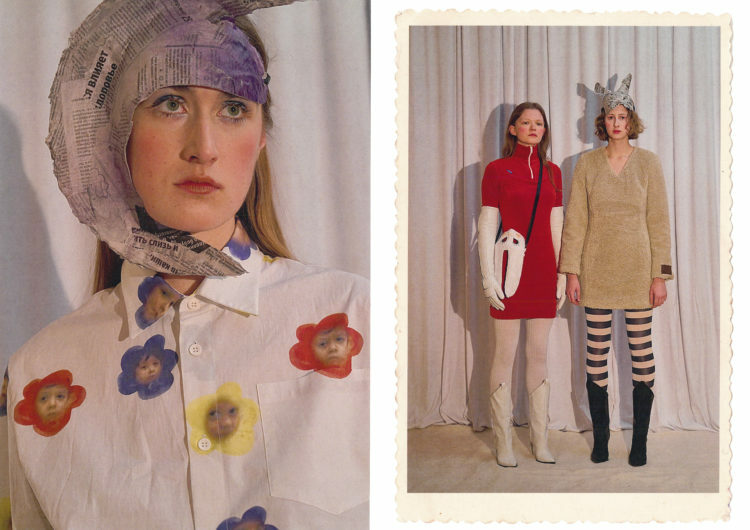 Your AW19 collection, although nostalgic, is also very surreal – what mood were you hoping to conjure? What would you like people to take from the collection? It is, indeed, surreal. This nostalgic collection was conceived when a lot was changing in my life. I now live between Kiev and Paris, and this sense of disconnection got mixed in—I was thinking a lot about the past, and at the same time, dreaming about the future. How would you describe the fashion you grew up around? I grew up during the crazy 90s in a Post-Soviet country, and this pretty much says it :-). Of course this decade is always faintly present in my work. But when some people tell me they like the 90s I laugh – they’ve never lived in those times and have no idea. What is your main goal as a designer? To make things that make people think.